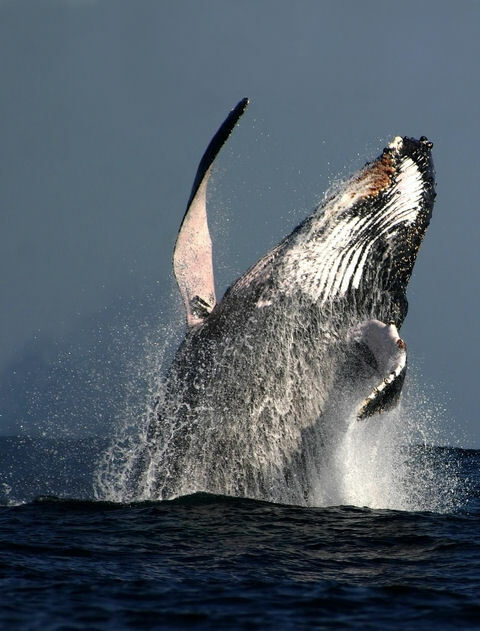 The Whale Watching Adventure includes a 100% guarantee you will see whales! You will begin in downtown Juneau at the main cruise ship terminal where you will board a bus driven by a local tour guide. The drive to the whale watching harbor includes a narrated tour during a scenic drive through the historic streets of downtown Juneau. You will pass the State Capitol Building, majestic mountains, and the Mendenhall Wetlands State Wildlife Refuge. Once you arrive at the harbor, you will board a comfortable jet boat equipped with outdoor decks for viewing, restrooms, and a fully-enclosed heated cabin. The captain and naturalist lead the way on an unforgettable search for whales in the calm waters surrounding Juneau, Alaska. This tour guarantees you will see whales, but there is also a good chance of seeing other wildlife that call Southeast Alaska home. These include harbor seals, Steller sea lions, bald eagles, black bears, and Killer whales. This area is one of the most populated feeding grounds in the world, which enables us to guarantee whale sightings. Be prepared for wildlife viewing at it's best with picturesque snow-capped mountains in the background. Complimentary snacks and beverages are included in the price of the tour. Our captains are so confident that you will find a whale that they will offer a full refund if you do not! Wear Layers. Bring your Camera. Our Boats are designed for that up close view of the Whales with both indoor and outdoor viewing options. The entire tour time is approximately 3 hours to and from the cruise terminal. Child's rates if applicable are for children age 3 to 12. Children under 2 are free, but you must contact us after booking if you have a child under 2. Each boat is fully enclosed and heated with a marine restroom onboard.